It is a very well known saying that time is precious and everyone in this world is moving according to it. Therefore a device is highly required that accurately tells the time. Different varieties of watches are available in the world with different styles and selecting the right one plays a vital role in presenting some ones personality as they have become status icon and it is true in fact. There are some classical watches that tell you the time while there are some others that tell your worth to the world. Yes, here is the list of Top 10 World’s Most Expensive Watches that are innovatively designed and astonishingly featured; some are adorned with beautiful diamonds and gems while some are made interesting with some complicating mechanisms. Seat back, relax,(grab something to chew if you can) and peruse a compilation of the worlds priciest timepieces after the cut. It is a stunning and stylish expensive watch which is of phoenix shape and has a small sized dial. It is created with emeralds and 18 carat rhodium plated white gold and is embellished with more than 3000 amazing cut diamond weigh more than 80 carats and the one pear shaped diamond weighs about 3.53 carats. It is an expensive watch and is one of the renowned watches of Patek Philippe. It is made up of 18 carat yellow gold and was sold at an auction. This precisely and sophisticatedly designed watch has a polychrome and a dial of enamel that depicts the North American continent’s map. The map is localized in the center of the dial that gives the watch an extraordinary look. This beautiful and appealing watch is also called as fully iced. This watch has two parts of the case the first part is designed with 207 baguette cut diamonds, 481 brilliant cut diamonds, and an emerald cut diamond that is located on the top of the case whereas the second part contain a watch that has a dial made up of Polynesian mother of pearl and is adorned with 173 diamonds in baguette and brilliant cuts. This expensive watch has a 34mm cushion shaped single button chronograph that comprises of 18 carat pure white gold. It is designed with a silvered matte dial and has 23 beautiful jewels, gold dauphine hands, windows for month and day and also moon phases with date. It was manufactured on the brink of the crash of stock market and is known as one of the most important patrons of Patek Philippe. It is a stylish watch of its own kind having no comparison as not even a single model of this sort was ever made. This watch has the tendency to wind itself and you can find the time at any place in the world, it has an array of finishes to select from white, yellow and rose gold and the stunning platinum for discriminating buyers. This valuable watch was made in 1939, has 24 time zones and is crafted completely of platinum. This is the first watch that was worn on moon. Louis Moinet Meteoris Watch comprises of a collection of four different pieces, this collection characterizes the Solar System and each piece is more outstanding than the last. The pieces of meteorites are used in designing each watch, so each piece is featured with a rare meteorite; Tourbillon Rosetta Stone, Tourbillon Mars, Tourbillon Moon and Tourbillon Asteroid. The Meteoris Collection watches are very distinct from others watches, the other watches possess the most precious metals or the most rare diamonds but these four watches are designed with the oldest and rarest materials of the moon, mercury, Mars and asteroids. Hublot Diamond watch is one of the most expensive watches in the world. It is a beautiful watch that is designed and adorned with 1,280 diamonds that weigh 140 carats and it contains six stones each of them weigh at least three carats. It is a watch that requires a high time for creation as the company assigns seventeen employees that took fourteen months in its designing. It is an outstanding diamond watch that has 18 carat white gold dial of 4.4mm with 18 carat white gold lining and the bracelet also contains 18 carat white gold. It took over 1 full year just to find the diamonds and bring them to the headquarters from all corners of the earth. Every single stone was cut by a well renowned jeweler from New York, with over 40 years of experience, in order to make sure each bears the same cut signature. It is a classic watch that was made during the period of the world wars and was sold in Geneva in 2010 at a Christie’s auction. It possesses the honor of being the one of the largest sized wristwatches of that time, which is of a medium size according to today’s standards. This expensive and classic watch is featured with a perpetual calendar, chronograph and moon phase display and its case is designed with 18 carats yellow gold whereas the other extraordinary luxury features of this watch are bi-metallic compensation balance, applied gold Arabic numerals, 23 instruments of gemstone, date indicator and designing like a rail track for minute markings with silvered matte dial which measures 37 millimeters and is bigger than many other watches of that time period. Patek Philippe Super Complication is a watch that is made up of 18 carat gold and is wrapped within a glass cover of 36mm.It is an expensive timepiece that is also renowned as the most complicated timepiece of its time in the world till 1989, due to a number of complications it possess in the form of 24 mechanical functions that are further than time telling. This beautiful watch took a time period of five years for its completion and was made in 1933, originally designed for Henry Graves who was an American banker. It is an interesting watch of its own kind and also possesses an interesting history too. The most expensive watch that not only tells you the time but also tells the world your worth. With 874 rare diamonds the Chopard 201-carat watch used to be the world’s most expensive watch and still is the highest priced jewelry watch out on the market! This masterpiece is so exclusively designed with adorable colored diamonds of 201 carats. In this watch there are three impressive heart shaped diamonds, the pink diamond of 15 carat, the blue diamond of 12 carat, the white diamond of 11 carat that swing around a flower motif lined bracelet with yellow and white gold hardware and a handful of diamonds in between making up the remaining 163 carats. This beautiful and expensive watch that looks more like a bracelet is an impressive piece of creativity that firstly acts as jewelry and secondly acts as a timepiece. This watch is a simple and elegant timepiece that seems to be surrounded by appealing flowers. The spring loaded mechanism in this watch, which is when presses permits the three adorable heart shapes to open up mechanically and make it possible to view the time and also disclose the yellow diamond studded face of watch. 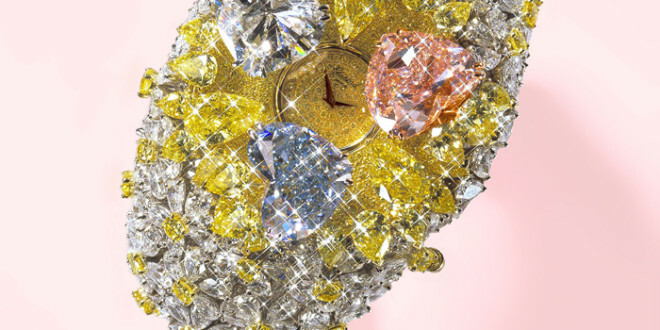 The world's most expensive time piece is a case watch not a wrist watch. It was commissioned by an alleged lover of Marie Antoinette, the French queen. Marie Antoinette did not get to see the watch, since it was completed 34 years after her execution. The watch was stolen in the late 1900′s and retrieved only in 2007. Ever since it was recovered, every top watch connoisseur wanted it. As of 2014 the watch is valued at at least $30 Million.